Dylan is back! Back in time and back in top form. 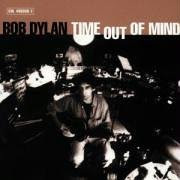 Time Out of Mind is a sprawling and consistently dark collection of songs where Dylan explores sounds that go further back than even is very long career. Dylan draws heavily on the Blues for this great comeback album. If you had considered him a spent force by the late 90s you would be profoundly wrong. In fact you shouldn't do that now in 2009. Admittedly this is no Blonde on Blonde or Blood on the Tracks, but it is still a worthy addition to any collection of Bob Dylan albums. Consistently good with an amazing 16 minute track to end it with. Recommended. The album features a particularly atmospheric sound, the work of producer (and past Dylan collaborator) Daniel Lanois, whose innovative work with carefully placed microphones and strategic mixing was detailed by Dylan in the first volume of his memoirs, Chronicles, Vol. 1. Despite being generally complimentary to Lanois, especially his work on the 1989 album Oh Mercy, Dylan has voiced dissatisfaction with the sound on Time Out of Mind. He has gone on to self-produce his subsequent albums.